Wings Over the World itineraries feature private charter flights between destinations, allowing you the convenience of visiting remote places with less time spent getting there. Explore two countries forever linked to the great Moorish culture that ruled them from the eighth to the 15th century, discovering how the Moors shaped the region’s iconic architecture and incredible cuisine on a luxury journey that features several UNESCO World Heritage Sites, a stay at A&K’s Exclusive Desert Tented Camp, and a private flamenco performance at a palace in Seville. Arrive in Granada, where you are met and transferred to your hotel. Tonight, join your Resident Tour Director and fellow guests for a cocktail, followed by a welcome dinner at your hotel. Discover the Alhambra, a medieval Muslim palace and UNESCO World Heritage Site, led by a top local guide. See the delicate beauty of the Nazaries Palace, the Court of Myrtles and the intricately decorated Court of the Lions. Then, discover the gardens of the Generalife, a palace from the days of Granada’s last Arab kings. Enjoy a private visit to the Fundación Rodríguez-Acosta Museum before boarding your privately chartered flight to Morocco, landing in Fez. Transfer to your hotel, a refurbished former palace, where you enjoy lunch. This afternoon, tour Fez el-Jedid (modern Fez). See the Royal Palace, madrasas (school mosques), the city wall and the mellah (Jewish quarter). Tonight, at your hotel, enjoy a special cocktail reception and dinner, joined by a guest speaker who reveals fascinating aspects of Moroccan culture. Explore Fez el-Bali (Old Fez), the cultural heart of Morocco. Stroll the labyrinthine old quarter, with its 9,000 narrow lanes, alleys and souks. Enter the intricately detailed 14th-century Karaouine — one of the oldest universities in the world, and then visit Nejjarine Square. 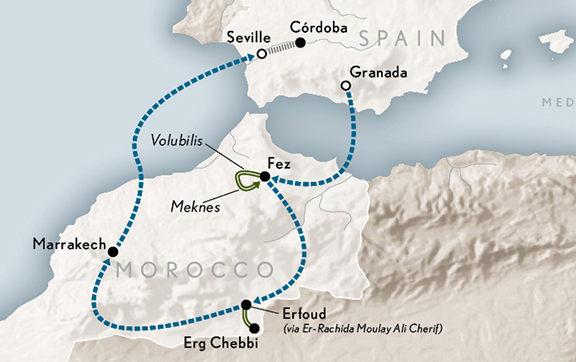 Journey overland to explore the Roman ruins of Volubilis, a UNESCO World Heritage Site brimming with iconic architecture and mosaics depicting mythical scenes. Proceed to a local winery outside of Meknes, for a special Chef ’s Table experience set among the region’s sun-bathed vineyards and olive groves. Enjoy a gourmet meal made from locally sourced, organic ingredients. Fly to Er-Rachidia Moulay Ali Cherif, and then transfer overland to Erfoud. Enjoy lunch before rolling out into the Sahara Desert, between the towering red sand dunes of Erg Chebbi, in a 4×4 vehicle. Change modes of transport, mounting a camel to complete your journey to A&K’s exclusive nomadic tented camp. As the sun sets over the dunes, toast your desert sojourn with a Scenic Sundowner. Later, enjoy authentic Moroccan entertainment beside a campfire, before adjourning to a nearby tent for a dinner of regional dishes with wine. Slumber tonight in comfort, in the silent Sahara. Fly by private charter to Marrakech, saving hours of over-the-road travel time. Upon arrival, enjoy lunch and a horse show featuring stunning Arabian stallions. Then, check in to your hotel — and your elegant riad room. Tonight, gather for a traditional Moroccan dinner prepared by an award-winning chef at the hotel’s restaurant. Explore Marrakech, starting at the 19th-century Bahia Palace. Then, visit the Ben Youssef Madrasa, an Islamic college adorned with marvellous carvings. Savour lunch in the lively medina, followed by an opportunity to discover the labyrinthine souks and Djemaa El Fna Square. Ride by horse-drawn carriage to Jardin Majorelle, a picturesque garden created by French painter Jacques Majorelle and later restored by design legend Yves Saint Laurent. Tour the on-site Berber Museum and the newly opened Yves Saint Laurent Museum nearby, which reveals his vast portfolio. This afternoon personalize your travel experience to suit your own interests by choosing from Design Your Day activities. Learn to Cook with Moroccan Spices – Perhaps no place on earth is more associated with fine spices than Marrakech, which you discover during a hands-on cooking class with a top local chef. Explore the Souks of Marrakech Venture with an expert guide into the souks, narrow winding streets lined with shops that have been plying locally grown food and handicrafts for centuries. Walk the Historic Jewish Quarter Visit the mellah — a once-thriving centre of Jewish life in Marrakech that shone as an example of religious freedom and tolerance — for a guided walking tour. Later, gather for a special dinner featuring entertainment by a gnaoua band. Board a privately chartered flight to Seville, Spain, where you check in to your hotel, and then walk with your guide to the Royal Alcázar — a monumental palace — for a special after-hours visit. Finish the evening with a tapas dinner. Today, enjoy a guided tour of the Seville Cathedral, followed by a guided visit to the Casa de Salinas, where you meet a member of the family that owns this small, private 16th-century palace. Tonight, after dinner at a local restaurant, make a private, after-hours visit to Hospital de la Caridad, to hear Gregorian chant performed live. Venture by train to Córdoba, in Spain’s Andalusia region, for a walking tour of its whitewashed medieval streets. Stroll to its heart: the old Jewish quarter, part of the historic centre of Córdoba, a UNESCO World Heritage Site. Then, discover the magnificent Mezquita, viewing its 10th-century splendours, and continuing to Medina Azahara, one of the main archaeological sites in Spain, before returning to Seville. Later this evening, ride by horse-drawn carriage to a private reception and farewell dinner, followed by a performance of flamenco dancing and singing — a fitting coda to your amazing Moorish adventure. Additional dates and rates may be available, please speak to one of our Travel Specialists for more information. Single Supplement rates are available on request. *Rates are subject to availability and changes without notice. Rate are based on the lowest available and may differ at time of booking. Other travel dates may be available at an additional cost. For more information and other conditions please confirm with our Travel Specialists at time of booking. A&K pride themselves on the service and standard of excellence for which they have become renowned. This service extends to every stage of your journey with Abercrombie & Kent, from the very start of your planning to the phone call you receive from us when you get back from your holiday. 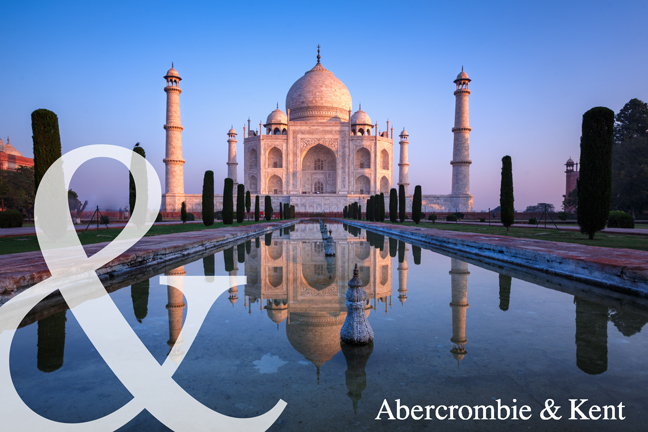 With local guides on the ground in 52 offices around the world, Abercrombie & Kent can provide you with exclusive insider access to experiences that other travel companies simply can’t provide. So whether you want a tour of the pyramids with your own Egyptologist, observe a private food offering ceremony with Buddhist monks in Thailand or browse the private art collection of the Medici’s in Florence, Abercrombie & Kent experts will know just how to make it happen. And as they are the partner of choice for many hotels and resorts, travellers are guaranteed to receive the best service available. World’s Best Health Resorts: Holiday for a New and Improved Healthier You!